CloudFlare vs Sucuri: Which One Should You Choose? I haven’t come across any clients who wouldn’t ask for security wall on their website. Seeing the security threats today, website security has become essentially critical. Our clients are usually confused about two of the most popular security services: CloudFlare Vs Sucuri. Both services offer website firewall, DDoS protection, and CDN. Before we dig deeper into the comparison, here’s the bottom line – There’s no best security service. It depends on your demands and which fits your situation perfectly at that moment. Both these website security services offer a website application firewall (WAF). By WAF, it means your website’s traffic goes through the server scanners. If there’s any malicious request, then the firewall would block it before it reaches your website. It becomes even more critical if you are a startup or a small business. But you need to know that free is not always better. It offers a free CDN service for all. You won’t be charged for the bandwidth i.e., you will be able to use their CDN services for free regardless of your traffic volume. This free plan won’t include Website Application Firewall. Although your website will be protected against DDoS attacks, bad traffic, spam, etc. But to include WAF, you need the Pro Plan that costs $20/month. This will provide a basic security for your website. However, you will miss out on custom SSL, advanced DDoS support which is available in the Business plan. For enterprise-grade DDoS mitigation (Layer 3,4 & 7), you will need to upgrade to Enterprise plan. There’s no free plan with Sucuri. Their website security stack plan starts at $199.99/year, which costs you less than CloudFlare’s Pro Plan. This will include full website monitoring, DDoS protection, free LetsEncrypt SSL certificate, malware removal and WAF. They offer 24*7 support in all their plans along with Live Chat support. Sucuri is cost-effective when it comes to small businesses. 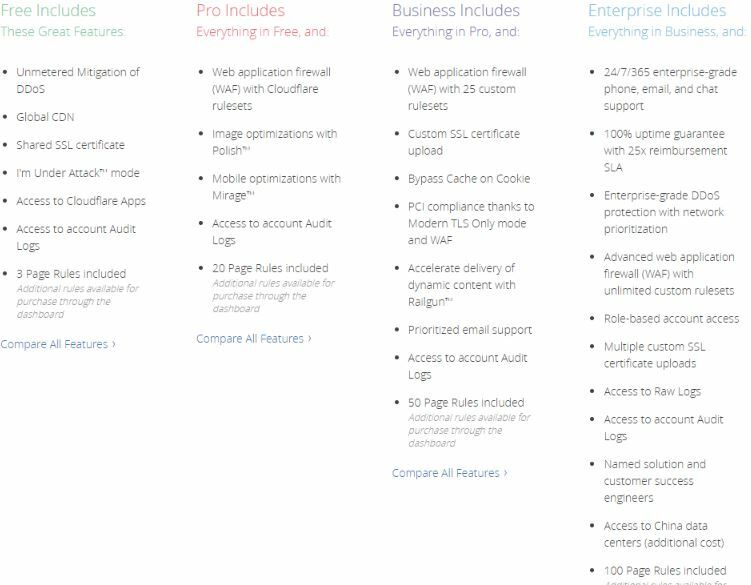 CloudFlare Pro costs $240/year vs Sucuri’s basic plan $199/year offering more features than CloudFlare. It is important to note that CloudFlare and Sucuri offer different plans with different sets of features. Analyze your requirements before making a decision. Most people opt for CloudFlare for their free CDN service. They are pioneers in mitigating DDoS attacks using their Website Application Firewall product. It keeps your site available to visitors under heavy traffic or an attack when your servers are unresponsive. Their firewall blocks suspicious traffic before it reaches your website. It even protects your website from registration spam and comments spam. Free and Custom SSL certificates included with all their plans. Free and Pro plans only allow you to use CloudFlare issued certs. For the custom certificate, you have to choose their Enterprise or Business plan. You will need a paid plan for using WAF on your website. There’s no server scanning service and malware removal guarantee. One of the most trusted website monitoring & security services. It offers comprehensive scanning for malware, website monitoring, malware removal services, and DDoS protection. It offers CloudProxy which is a loading balancing and website firewall service. It helps in blocking suspicious traffic from reaching your website by blocking bad bots, code injections, and other website threats. It offers free Let’s Encrypt SSL for their basic plan. You need to upgrade to professional and business plans for using custom SSL certificates. It scans your website regularly for malware, code injection, and file changes. They clean up hacked sites and support WordPress, Drupal, Joomla, and all other popular CMS software. Sucuri offers a better combination of tools and services like WAF, Load balancing, Hack Repair etc. Other than DDoS attacks, one of the most common threats faced by website owners is code injections and malware attacks. CloudFlare’s free version is a CDN which simply makes your website fast. Blacklist monitoring, malware scanning, and file change detection aren’t included. Sucuri is a clear winner in between Cloudflare vs Sucuri here offering a combination of services and website clean up if required. In CloudFlare vs Sucuri, Sucuri takes the lead in every aspect helping you prepare your website better for security. It has lower prices and better security and monitoring services when compared to CloudFlare. Claim your 15-min FREE Consultation Call. – Get expert advice on Website Security & Speed according to your requirement.